The week of April 11, 2011, AURA co-sponsored a three-day exposition with the Chilean Ministry of Foreign Relations, CONICYT, AUI, and Carnegie to highlight the strong collaboration between the US and Chile in the development of astronomy over the past 50 years and into the future with the next generation of US facilities. In 1961, AURA arrived in Chile to establish first major international observatory project there, the Cerro Tololo Inter-American Observatory (CTIO). With the recent commencement of site preparations for the Large Synoptic Survey Telescope (LSST), AURA continues its strong collaboration with Chile, both with the Chilean government and through its interactions with the Chilean astronomical community with support from the University of Chile. The exposition was opened with comments from the Chilean Foreign Minister, Alfredo Moreno, together with the US Ambassador to Chile, Alejandro Wolff, and highlighted the three "next generation" US projects in Chile: ALMA, GMT, and LSST. 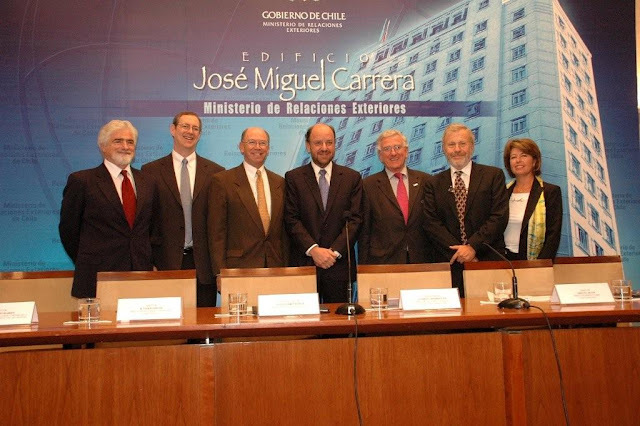 Pictured below are Eduardo Hardy (AUI Head of Mission), Chris Smith (AURA Head of Mission), Alejandro Wolff (US Ambassador to Chile), Alfredo Moreno (Chilean Foreign Minister), Gabriel Rodriguez (Chilean "Ambassador" of Directory of Energy, Science, Technology, and Innovation, in charge of International Observatory relations), Miguel Roth (Carnegie Head of Mission), Monica Rubio (CONICYT Head of Astronomy Division).